The SyncMaster 243T screen also pivots 90 degrees around, transforming from 'landscape' to a massive 'portrait' screen with a native resolution of 1200x1920! More on this in a moment. 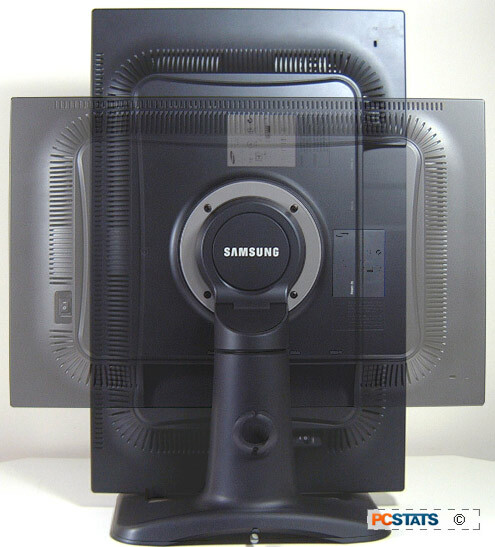 The 24" Samsung 243T display can be detached from the base for wall mounting if desired. A set of four Phillips screws secure the base to the back of the LCD panel. Underneath are a set of four standard 100mm VESA mounting points. No wall-mounting plate is included in the package. 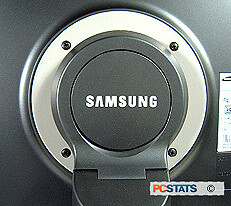 The Samsung SyncMaster 243T measures about 23" x 20" x 10" and weighs 21lb including the metal base. power consumption is rated at 90W with the screen set to maximum brightness.